3. 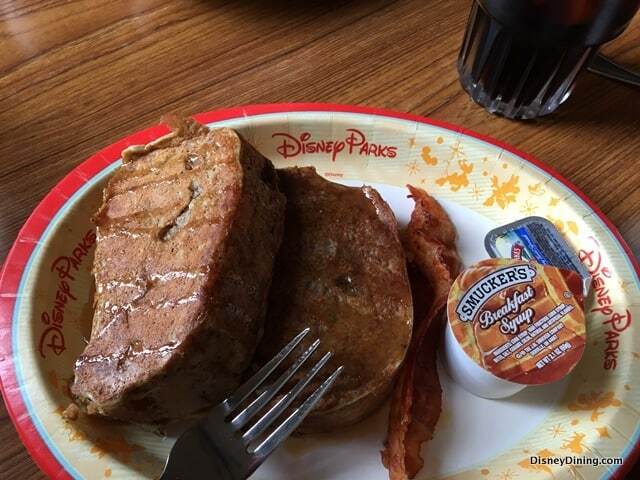 Banana Bread French Toast – Olivia’s Café – Disney’s Old Key West Resort invokes the charm and relaxed atmosphere of the Florida Keys with pastel colors, swaying palm trees, and some wonderful dining options. Guests who visit the Disney Resort might be aware of Olivia’s Café for lunch and dinner, but the full service dining location also serves up some amazing breakfast options. The menu at Olivia’s Café features traditional flavors of the Florida Keys, and guests are sure to absolutely love the Banana Bread French Toast. This decadent and sweet breakfast features fluffy French Toast topped with Bahamian Banana-Rum Syrup and Cocoanut Whipped Cream and is served with the choice of bacon, sausage, or ham. Combining a sweet and comforting breakfast classic with the tropical flavors of the Florida Keys is the perfect way to start any day at Olivia’s Café.